"After death", "Life after death", and "Hereafter" redirect here. For other uses, see After death (disambiguation), Life after death (disambiguation), and Hereafter (disambiguation). The afterlife (also referred to as life after death) is the belief that the essential part of an individual's identity or the stream of consciousness continues after the death of the physical body. 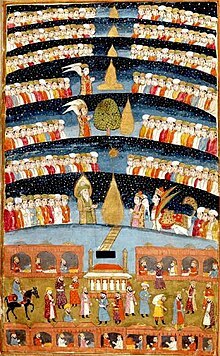 According to various ideas about the afterlife, the essential aspect of the individual that lives on after death may be some partial element, or the entire soul or spirit, of an individual, which carries with it and may confer personal identity or, on the contrary, may not, as in Indian nirvana. Belief in an afterlife is in contrast to the belief in oblivion after death. The "Spiritual Combat", a written work by Lorenzo Scupoli, states that four assaults are attempted by the "evil one" at the hour of death. The Catholic conception of the afterlife teaches that after the body dies, the soul is judged, the righteous and free of sin enter Heaven. However, those who die in unrepented mortal sin go to hell. 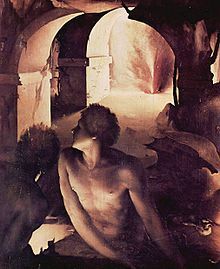 In the 1990s, the Catechism of the Catholic Church defined hell not as punishment imposed on the sinner but rather as the sinner's self-exclusion from God. Unlike other Christian groups, the Catholic Church teaches that those who die in a state of grace, but still carry venial sin go to a place called Purgatory where they undergo purification to enter Heaven. The Orthodox Church is intentionally reticent on the afterlife, as it acknowledges the mystery especially of things that have not yet occurred. Beyond the second coming of Jesus, bodily resurrection, and final judgment, all of which is affirmed in the Nicene Creed (325 CE), Orthodoxy does not teach much else in any definitive manner. Unlike Western forms of Christianity, however, Orthodoxy is traditionally non-dualist and does not teach that there are two separate literal locations of heaven and hell, but instead acknowledges that "the 'location' of one's final destiny—heaven or hell—as being figurative." Instead, Orthodoxy teaches that the final judgment is simply one's uniform encounter with divine love and mercy, but this encounter is experienced multifariously depending on the extent to which one has been transformed, partaken of divinity, and is therefore compatible or incompatible with God. "The monadic, immutable, and ceaseless object of eschatological encounter is therefore the love and mercy of God, his glory which infuses the heavenly temple, and it is the subjective human reaction which engenders multiplicity or any division of experience." For instance, St. Isaac the Syrian observes that "those who are punished in Gehenna, are scourged by the scourge of love. ... The power of love works in two ways: it torments sinners ... [as] bitter regret. But love inebriates the souls of the sons of Heaven by its delectability." In this sense, the divine action is always, immutably, and uniformly love and if one experiences this love negatively, the experience is then one of self-condemnation because of free will rather than condemnation by God. Orthodoxy therefore uses the description of Jesus' judgment in John 3:19–21 as their model: "19 And this is the judgment: the light has come into the world, and people loved the darkness rather than the light because their works were evil. 20 For everyone who does wicked things hates the light and does not come to the light, lest his works should be exposed. 21 But whoever does what is true comes to the light, so that it may be clearly seen that his works have been carried out in God." As a characteristically Orthodox understanding, then, Fr. Thomas Hopko writes, "[I]t is precisely the presence of God's mercy and love which cause the torment of the wicked. God does not punish; he forgives... . In a word, God has mercy on all, whether all like it or not. If we like it, it is paradise; if we do not, it is hell. Every knee will bend before the Lord. Everything will be subject to Him. God in Christ will indeed be "all and in all," with boundless mercy and unconditional pardon. But not all will rejoice in God's gift of forgiveness, and that choice will be judgment, the self-inflicted source of their sorrow and pain." Moreover, Orthodoxy includes a prevalent tradition of apokatastasis, or the restoration of all things in the end. This has been taught most notably by Origen, but also many other Church fathers and Saints, including Gregory of Nyssa. The Second Council of Constantinople (553 CE) affirmed the orthodoxy of Gregory of Nyssa while simultaneously condemning Origen's brand of universalism because it taught the restoration back to our pre-existent state, which Orthodoxy doesn't teach. It is also a teaching of such eminent Orthodox theologians as Olivier Clément, Metropolitan Kallistos Ware, and Bishop Hilarion Alfeyev. Although apokatastasis is not a dogma of the church but instead a theologoumena, it is no less a teaching of the Orthodox Church than its rejection. As Met. Kallistos Ware explains, "It is heretical to say that all must be saved, for this is to deny free will; but, it is legitimate to hope that all may be saved," as insisting on torment without end also denies free will. Joseph F. Smith of The Church of Jesus Christ of Latter-day Saints presents an elaborate vision of the afterlife. It is revealed as the scene of an extensive missionary effort by righteous spirits in paradise to redeem those still in darkness—a spirit prison or "hell" where the spirits of the dead remain until judgment. It is divided into two parts: Spirit Prison and Paradise. Together these are also known as the Spirit World (also Abraham's Bosom; see Luke 16:19–25). They believe that Christ visited spirit prison (1 Peter 3:18–20) and opened the gate for those who repent to cross over to Paradise. This is similar to the Harrowing of Hell doctrine of some mainstream Christian faiths. Both Spirit Prison and Paradise are temporary according to Latter-day Saint beliefs. After the resurrection, spirits are assigned "permanently" to three degrees of heavenly glory, determined by how they lived – Celestial, Terrestrial, and Telestial. (1 Cor 15:44–42; Doctrine and Covenants, Section 76) Sons of Perdition, or those who have known and seen God and deny it, will be sent to the realm of Satan, which is called Outer Darkness, where they shall live in misery and agony forever. The Islamic belief in the afterlife as stated in the Quran is descriptive. The Arabic word for Paradise is Jannah and Hell is Jahannam. Their level of comfort while in the grave (according to some commentators) depends wholly on their level of iman or faith in the one almighty creator or supreme being (God or Allah). In order for one to achieve proper, firm and healthy iman one must practice righteous deeds or else his level of iman chokes and shrinks and eventually can wither away if one does not practice Islam long enough, hence the depth of practicing Islam is good deeds. One may also acquire tasbih and recite the names of Allah in such manner as Subahann Allah or "Glory be to Allah" over and over again to acquire good deeds. Ahmadi believe that the afterlife is not material but of a spiritual nature. According to Mirza Ghulam Ahmad, the founder of Ahmadiyya religion, the soul will give birth to another rarer entity and will resemble the life on this earth in the sense that this entity will bear a similar relationship to the soul as the soul bears relationship with the human existence on earth. On earth, if a person leads a righteous life and submits to the will of God, his or her tastes become attuned to enjoying spiritual pleasures as opposed to carnal desires. With this, an "embryonic soul" begins to take shape. Different tastes are said to be born which a person given to carnal passions finds no enjoyment. For example, sacrifice of one's own rights over that of others becomes enjoyable, or that forgiveness becomes second nature. In such a state a person finds contentment and peace at heart and at this stage, according to Ahmadiyya beliefs, it can be said that a soul within the soul has begun to take shape. While the Hebrew Bible appears to describe Sheol as the permanent place of the dead, in the Second Temple period (roughly 500 BC – 70 AD) a more diverse set of ideas developed. In some texts, Sheol is considered to be the home of both the righteous and the wicked, separated into respective compartments; in others, it was considered a place of punishment, meant for the wicked dead alone. When the Hebrew scriptures were translated into Greek in ancient Alexandria around 200 BC, the word "Hades" (the Greek underworld) was substituted for Sheol. This is reflected in the New Testament where Hades is both the underworld of the dead and the personification of the evil it represents. Shraga Simmons commented that within the Bible itself, the idea [of reincarnation] is intimated in Deut. 25:5–10, Deut. 33:6 and Isaiah 22:14, 65:6. Yirmiyahu Ullman wrote that reincarnation is an "ancient, mainstream belief in Judaism". The Zohar makes frequent and lengthy references to reincarnation. Onkelos, a righteous convert and authoritative commentator of the same period, explained the verse, "Let Reuben live and not die ..." (Deuteronomy 33:6) to mean that Reuben should merit the World to Come directly, and not have to die again as a result of being reincarnated. Torah scholar, commentator and kabbalist, Nachmanides (Ramban 1195–1270), attributed Job's suffering to reincarnation, as hinted in Job's saying "God does all these things twice or three times with a man, to bring back his soul from the pit to ... the light of the living' (Job 33:29, 30)." Jainism also believes in the afterlife. They believe that the soul takes on a body form based on previous karmas or actions performed by that soul through eternity. Jains believe the soul is eternal and that the freedom from the cycle of reincarnation is the means to attain eternal bliss. After 25 years of parapsychological research, Susan Blackmore came to the conclusion according to her experiences there is not enough empirical evidence for many of these cases ., despite the contrary affirm other parapsychologists specialized in the subject. There is a view based on the philosophical question of personal identity, termed open individualism by Daniel Kolak. It concludes that individual conscious experience is illusory, and because consciousness continues after death in all conscious beings, you do not die. This position has been supported by notable physicists such as Erwin Schrödinger and Freeman Dyson. Regarding the mind–body problem, some neuroscientists take a physicalist position according to which consciousness derives from and/or is reducible to physical phenomena such as neuronal activity occurring in the brain. The implication of this premise is that once the brain stops functioning at brain death, consciousness fails to survive and ceases to exist. Theoretical physicist Stephen Hawking rejected the concept of an afterlife, saying, "I regard the brain as a computer which will stop working when its components fail. There is no heaven or afterlife for broken down computers; that is a fairy story for people afraid of the dark". In 2008, a large-scale study conducted by the University of Southhampton involving 2060 patients from 15 hospitals in the United Kingdom, United States and Austria was launched. The AWARE (AWAreness during REsuscitation) study examined the broad range of mental experiences in relation to death. In a large study, researchers also tested the validity of conscious experiences for the first time using objective markers, to determine whether claims of awareness compatible with out-of-body experiences correspond with real or hallucinatory events. The results revealed that 40% of those who survived a cardiac arrest were aware during the time that they were clinically dead and before their hearts were restarted. Dr. Parnia, in the interview stated: “The evidence thus far suggests that in the first few minutes after death, consciousness is not annihilated. ^ Mark Juergensmeyer & Wade Clark Roof 2011, pp. 271–72. ^ Mark Juergensmeyer & Wade Clark Roof 2011, pp. 271-272. ^ Norman C. McClelland 2010, pp. 102–03. ^ Gananath Obeyesekere, Imagining Karma: Ethical Transformation in Amerindian, Buddhist, and Greek Rebirth. University of California Press, 2002, p. 15. ^ "Life after death – Where do we go after we die?". SSRF English. Retrieved 2018-03-09. ^ Bard, Katheryn (1999). Encyclopedia of the Archaeology of Ancient Egypt. Routledge. ^ "Door to Afterlife found in Egyptian tomb". www.meeja.com.au. 2010-03-30. Archived from the original on 2011-07-06. Retrieved 2008-09-30. ^ F. P. Retief and L. Cilliers, "Burial customs, the afterlife and the pollution of death in ancient Greece", Acta Theologica 26(2), 2006, p. 45 (PDF). ^ "Norse Mythology | The Nine Worlds". www.viking-mythology.com. Retrieved 2016-05-11. ^ "Fólkvangr, Freyja welcomes you to the Field of the Host". Spangenhelm. 2016-05-20. Retrieved 2017-07-10. ^ a b Smith, Peter (2000). "burial, "death and afterlife", evil, evil spirits, sin". A concise encyclopedia of the Bahá'í Faith. Oxford: Oneworld Publications. pp. 96–97, 118–19, 135–36, 322–23. ISBN 978-1-85168-184-6. ^ "Matthew 22:23–33". Biblegateway.com. Retrieved 2014-03-08. ^ "The New American Bible". Vatican.va. Retrieved 2014-03-08. ^ Fosdick, Harry Emerson. A guide to understanding the Bible. New York: Harper & Brothers. 1956. p. 276. ^ "purgatory". The Columbia Electronic Encyclopedia, Sixth Edition. Columbia University Press., 2003. Answers.com 06 Jun. 2007. ^ "Charlton T. Lewis, Charles Short, A Latin Dictionary". Perseus.tufts.edu. Retrieved 2014-03-08. ^ a b "Swedenborg, E. Heaven and Hell (Swedenborg Foundation, 2000)". ^ "limbo – definition of limbo by the Free Online Dictionary, Thesaurus and Encyclopedia". Thefreedictionary.com. Retrieved 2014-03-08. ^ Ted Campbell, Methodist Doctrine: The Essentials (Abingdon 1999), quoted in Feature article by United Methodist Reporter Managing Editor Robin Russell Archived 2011-07-22 at the Wayback Machine and in FAQ Belief: What happens immediately after a person dies? ^ a b Andrew P. Klager, "Orthodox Eschatology and St. Gregory of Nyssa's De vita Moysis: Transfiguration, Cosmic Unity, and Compassion," In Compassionate Eschatology: The Future as Friend, eds. Ted Grimsrud & Michael Hardin, 230–52 (Eugene, OR: Wipf & Stock, 2011), 245. ^ St. Isaac the Syrian, "Homily 28," In The Ascetical Homilies of Saint Isaac the Syrian, trans. Dana Miller (Brookline, MA: Holy Transfiguration Monastery Press, 1984), 141. ^ Fr. Thomas Hopko, "Foreword," in The Orthodox Church, Sergius Bulgakov (Crestwood, NY: St. Vladimir's Seminary Press, 1988), xiii. ^ Andrew P. Klager, "Orthodox Eschatology and St. Gregory of Nyssa's De vita Moysis: Transfiguration, Cosmic Unity, and Compassion," In Compassionate Eschatology: The Future as Friend, eds. Ted Grimsrud & Michael Hardin, 230–52 (Eugene, OR: Wipf & Stock, 2011), 251. ^ Kallistos Ware, The Orthodox Church (New York: Penguin, 1997), 262. ^ Doctrine and Covenants, Section 76. ^ "Is Gehenna a Place of Fiery Torment?". The Watchtower: 31. April 1, 2011. ^ Reasoning From the Scriptures. pp. 168–75. ^ Insight on the Scriptures. 2. pp. 574–76. ^ "The Official Site of the Seventh-day Adventist world church". Adventist.org. Retrieved 2014-03-08. ^ Smith, Jane Idleman; Haddad, Yvonne (2008-05-06). Afterlife – Oxford Islamic Studies Online. Oxfordislamicstudies.com. doi:10.1093/0195156498.001.0001. ISBN 978-0-19-515649-2. Retrieved 2014-03-08. ^ Ibn Al-Arabi, Muhyiddin (2006). Angela Jaffray (ed.). The Universal Tree and The Four Birds. Anqa Publishing. pp. 29n, 50n, 59, 64–68, 73, 75–78, 82, 102. ^ "Tractate Sanhedrin: Interpolated Section: Those Who have no Share in the World to Come". Sacred-texts.com. Retrieved 2014-03-08. ^ "Jehoiakim". Jewishvirtuallibrary.org. Retrieved 2014-03-08. ^ "soc.culture.jewish FAQ: Jewish Thought (6/12) Section - Question 12.8: What do Jews say happens when a person dies? Do Jews believe in reincarnation? In hell or heaven? Purgato". Faqs.org. 2012-08-08. Retrieved 2014-03-08. ^ "Ask the Rabbi – Reincarnation". Judaism.about.com. 2009-12-17. Retrieved 2014-03-08. ^ Yirmiyahu, Rabbi (2003-07-12). "Reincarnation " Ask! " Ohr Somayach". Ohr.edu. Retrieved 2014-03-08. ^ "Reincarnation and the Holocaust FAQ". Archived from the original on 2011-07-16. ^ "Where does the soul go? New course explores spiritual existence". Middletown, CT. West Hartford News. October 14, 2015. ^ Becker, Carl B. (1993). Breaking the circle: death and the afterlife in Buddhism. Carbondale: Southern Illinois University Press. p. viii. ISBN 978-0-585-03949-7. Buddhists believe in karma and rebirth, and yet they deny the existence of permanent souls. ^ Jhaveri, Pujya Gurudevshri Rakeshbhai. "Death the Awakener". Shrimad Rajchandra Mission Dharampur. Shrimad Rajchandra Mission Dharampur. Retrieved 21 January 2018. ^ "Sikhism: What happens after death?". ^ Bond, George C. (1992). "Living with Spirits: Death and Afterlife in African Religions". In Obayashi, Hiroshi (ed.). Death and Afterlife: Perspectives of World Religions. New York: Greenwood Press. pp. 3–18. ISBN 978-0-313-27906-5. The entire process of death and burial is simple, without elaborate rituals and beliefs in an afterlife. The social and spiritual existence of the person ends with the burial of the corpse. ^ Bond, George C. (1992). "Living with Spirits: Death and Afterlife in African Religions". In Obayashi, Hiroshi (ed.). Death and Afterlife: Perspectives of World Religions. New York: Greenwood Press. pp. 3–18. ISBN 978-0-313-27906-5. The belief in the ancestors remains a strong and active spiritual and moral force in the daily lives of the Yombe; the ancestors are thought to intervene in the affairs of the living.... The afterlife is this world. ^ Gottlieb, Alma; Graham, Philip; Gottlieb-Graham, Nathaniel (1998). "Infants, Ancestors, and the Afterlife: Fieldwork's Family Values in Rural West Africa". Anthropology and Humanism. 23 (2): 121. doi:10.1525/ahu.1998.23.2.121. But Kokora Kouassi, an old friend and respected Master of the Earth in the village of Asagbé, came to our compound early one morning to describe the dream he had just had: he had been visited by the revered and ancient founder of his matriclan, Denju, who confided that Nathaniel was his reincarnation and so should be given his name. The following morning a small ritual was held, and Nathaniel was officially announced to the world not only as Denju but as N'zri Denju—Grandfather Denju—an honorific that came to be used even by Nathaniel's closest playing companions. ^ a b Opoku, Kofi Asare (1987). "Death and Immortality in the African Religious Heritage". In Badham, Paul; Badham, Linda (eds.). Death and Immortality in the Religions of the World. New York: Paragon House. pp. 9–23. ISBN 978-0-913757-54-3. Retrieved 23 June 2015. ^ Bond, George C. (1992). "Living with Spirits: Death and Afterlife in African Religions". In Obayashi, Hiroshi (ed.). Death and Afterlife: Perspectives of World Religions. New York: Greenwood Press. pp. 3–18. ISBN 978-0-313-27906-5. The process of being born, dying, and moving to a lower level of earth continues through ten lives. ^ Bond, George C. (1992). "Living with Spirits: Death and Afterlife in African Religions". In Obayashi, Hiroshi (ed.). Death and Afterlife: Perspectives of World Religions. New York: Greenwood Press. pp. 3–18. ISBN 978-0-313-27906-5. The ancestors are of people, whereas God is external to creation. They are of this world and close to the living. The Yombe believe that the afterlife of the ancestors lies in this world and that they are a spiritual and moral force within it. ^ Bond, George C. (1992). "Living with Spirits: Death and Afterlife in African Religions". In Obayashi, Hiroshi (ed.). Death and Afterlife: Perspectives of World Religions. New York: Greenwood Press. pp. 3–18. ISBN 978-0-313-27906-5. Death represents a transition from corporeal to incorporeal life in the religious heritage of Africa and the incorporeal life is taken to be as real as the corporeal. ^ Ephirim-Donkor, Anthony (2012). African Religion Defined a Systematic Study of Ancestor Worship among the Akan (2nd ed.). Lanham: University Press of America. p. 26. ISBN 978-0-7618-6058-7. Retrieved 25 June 2015. ^ Bond, Jon (2004-06-13). "Unitarians: unitarian view of afterlife, unitarian universalist association uua, unitarian universalist association". En.allexperts.com. Archived from the original on 2015-11-06. Retrieved 2014-03-08. ^ a b Bartlett, Sarah (2015). The Afterlife Bible: The Complete Guide to Otherworldly Experience. Octopus Publishing Group. ISBN 978-1-84181-449-0. ^ David Fontana (2005): Is there an afterlife. A comprehensive overview of the evidence. ^ "Near-death experience in survivors of cardiac arrest: a prospective study in the Netherlands". Profezie3m.altervista.org. Retrieved 2014-03-08. ^ "Nurse writes book on near-death". BBC News. 2008-06-19. Retrieved 6 August 2008. ^ Roach, Mary (2005). Spook – Science Tackles the Afterlife. W. W. Norton & Co. ISBN 978-0-393-05962-5. ^ Urban Legends – Reference Page (Soul man). ^ Park, Robert Ezra (2010). Superstition: Belief in the Age of Science. Princeton, NJ: Princeton University Press. p. 90. ISBN 978-0-691-14597-6. ^ Tipler, Franl, J. (1997). The Physics of Immortality – Modern Cosmology, God and the Resurrection of the Dead. Anchor. ISBN 978-0-385-46799-5. ^ "Skeptical Odysseys: Personal Accounts by the World's Leading Paranormal Inquirers pp. 85–94". Susanblackmore.co.uk. 2002-03-25. Retrieved 2014-03-08. ^ Kurtz, Paul (2001). Skeptical Odysseys: Personal Accounts by the World's Leading Paranormal Inquirers. Prometheus Books. ISBN 978-1-57392-884-7. ^ Kolak, Daniel (2005). I Am You: The Metaphysical Foundations for Global Ethics. Springer. ISBN 978-1-4020-2999-8. ^ Peter van Inwagen. "I Look for the Resurrection of the Dead and the Life of the World to Come". Archived from the original on 2007-06-10. ^ David Griffin, "The Possibility of Subjective Immortality in Whitehead's Philosophy," in The Modern Schoolman, LIII, November. 1975, pp. 39–51. ^ James H. Schwartz. Appendix D: Consciousness and the Neurobiology of the Twenty-First Century. In Kandel, ER; Schwartz JH; Jessell TM. (2000). Principles of Neural Science, 4th Edition. ^ Pinker, Steven. "The Brain: The Mystery of Consciousness". Time. Monday, January 29, 2007. ^ Bernat JL (8 Apr 2006). "Chronic disorders of consciousness". Lancet. 367 (9517): 1181–92. doi:10.1016/S0140-6736(06)68508-5. PMID 16616561. ^ Laureys, Steven; Tononi, Giulio. (2009). The Neurology of Consciousness: Cognitive Neuroscience and Neuropathology. Academic Press. p. 20. ISBN 978-0-12-374168-4 "In brain death there is irreversible cessation of all functions of the brain including the brainstem. Consciousness is, therefore, permanently lost in brain death." ^ Sample, Ian (15 May 2011). "Stephen Hawking: 'There is no heaven; it's a fairy story'". The Guardian. Retrieved 9 January 2019. ^ Pereira, Vera; Faísca, Luís; de Sá-Saraiva, Rodrigo (1 January 2012). "Immortality of the Soul as an Intuitive Idea: Towards a Psychological Explanation of the Origins of Afterlife Beliefs" (PDF). Journal of Cognition and Culture. 12 (1): 121. doi:10.1163/156853712X633956. hdl:10400.1/4894. ^ Misailidi, Plousia; Kornilaki, Ekaterina N (April 2015). "Development of Afterlife Beliefs in Childhood: Relationship to Parent Beliefs and Testimony". Merrill-Palmer Quarterly. 61 (2): 290–318. ISSN 0272-930X. ^ "Results of world's largest Near Death Experiences". 7 October 2014. Retrieved 16 January 2019. ^ "Consciousness after clinical death. The biggest ever scientific study published". Retrieved 16 January 2019. Afterlife: A History of Life after Death by Philip C Almond(London and Ithaca NY: I.B. Tauris and Cornell University Press, 2015). Hasker, William. "Afterlife". In Zalta, Edward N. (ed.). Stanford Encyclopedia of Philosophy.